We suppose this wasn't much of a mystery. 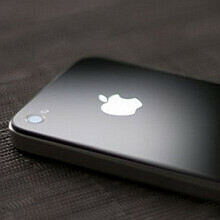 BTIG Research determined that the iPhone 4 is the best-selling device at Verizon and AT&T retail locations. They conducted the survey by contacting 250 retail stores, and asking them which devices were selling better than others. They didn't ask for specific numbers, so we can only see the percentage of stores at which a device is dominant. 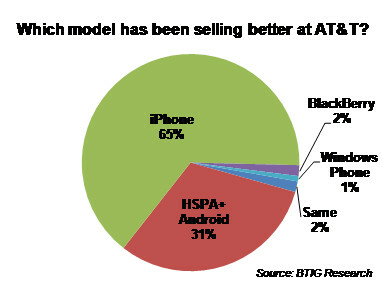 At AT&T, the iPhone 4 has a commanding lead as the top device at 65% of AT&T's locations. Android devices were the top sellers at 31% of stores. At Verizon, the iPhone 4 is the top seller at 51% of stores, and 4G LTE Android handsets are the top sellers at 11% of stores. 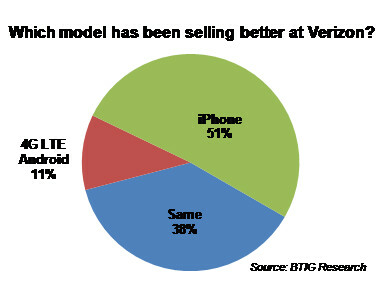 In case you didn't catch that, BTIG made the odd choice to compare the iPhone 4 with 4G LTE Android handsets at Verizon, rather than Android handsets overall. The real shocker is that 2% of AT&T stores reported BlackBerry as the top seller, and 1% of stores reported Windows Phone 7 as the top seller. We think it would be interesting to see where those locations are (geographically, demographically), to see why those stores are defying the odds. Is it a shocker that 2% of the stores said that blackberry was the top seller because is it a low number or a high number? Because it's a high number. I'd love to know how that happens at ANY store when you consider how hot the iPhone, Atrix and Inspire are. I have to comment.... 4G LTE phones with Verizon are the Thunderbolt by HTC, Samsung Charge and LG Revolution. (Why didn't they compare all Android phones vice only 4G/LTE devices)----which aren't selling that great due to the fact that they are overpriced with horrible battery life and LTE not everywhere, which make people opt for the Droid X2, DroidX, Incredible2, Droid Global, Samsung Fascinate...why didn't the survey include these devices....they are Android....don't just limit to 4G LTE devices.......I'm am sure the iphone would not have had this high number of sales. What kinda of math did you learn? I'm not trying to be insulting im just wondering what formula you would use to come to that conclusion? Apple(A) has 51% at Verizon stores, LTE android(L) has 11%. The variables are all other android devices(x) and all other devices(y). If the whole is 100%, and Apple has 51%, then the equation goes like this: A+L+X+Y=100% Now we know the value of X is the total amount of android devices minus L, which itself cannot be more than 38%. 38% must be the limit for X. It cannot be bigger than that because A is not a variable. It is a fixed 51%. That doesn't change no matter what other number you throw on or "Hide". This is basic algebra. I'm not being an Apple fan or an android hater. These are numbers that's all. Its a poll of how well phones are selling in stores that were polled. So it does mean that the other 38% consists of non lte android phones and non Apple devices. Its using a pie chart. A pie chart should tell u this is based off a 100% pool model. Meaning if 62% is accounted for then 38% must be the remaining and cannot consist of items from the 62%. Its very straight forward. To think that just because non lte Android devices weren't mentioned they aren't considered is naive at best. They were considered, that's evident by the use of percentages of all phones sold. You can't have percentages of 2 types of phones sold and not account the others if the 2 don't equal 100%. The problem here is that only lte Android devices were compared. That's what is tripping people up. But by no means does it mean they were the only ones looked at. So the other 38% of Verizon stores not mentioned sold more devices that were not lte or Apple. That might mean the other 38% sold more android than anything else. Or that could be 37% and 1% sold more blackberry. Or however you wanna add it up but the numbers remain to say no more than 49% of stores sold more android than anything else. In that case then, you have assumed that the 38% consists of some other option that is neither "4G LTE" or "iPhone". There is absolutely no basis for this assumption, and just because a pie chart "adds up" to 100% does not mean that it represents all of the phones sold by the "sample" store locations. BTIG Research has couched their words and displays quite carefully to show favor to a certain handset maker, and in the process they have opened the door to extreme misinterpretation and assumptions as well... this "survey" was done very poorly, and the results were presented in an even poorer fashion. BTIG Research has wasted PA's time and web page resources, and honestly I do not feel like wasting any more of my time trying to help people here see this BTIG "survey" for what it is... a biased, illegitimate sham! Don't know where you learned your English but it's OF the stores on which device that sold better. That means throughout the Verizon stores used in this research, 51% of Verizon stores were selling the iPhone better. ie. Out of 100 Verizon stores, the iPhone is the best selling in 51 stores when compared to LTE devices. 11 stores have the LTE devices as best selling. Your overly convuluted math is right, but your reading skills need checked. Apple is best seeling AT 51% OF Verizon retail locations. That has nothing to do with the actual number of phones. You could, for instance, have a crappy kiosk location selling 20 phones a month with the majority of those being IPhones. Yeah, why no mention of non 4G Android devices? And why just store locations? this sounds a little suspicious! "They didn't ask for specific numbers, so we can only see the percentage of stores at which a device is dominant." Well, so long as it is accurate. No sales person would ever lie to slant numbers to his/her favorite devices, now would they??? iPhone is an amazingly well supported device. Apple refuses to allow it out of the consumers mind. While Android as an OS may be larger, I doubt we will see any single device outsell it as long as the brain trust at Apple stays intact. Meaningless statistic - You could sell 40 Android phones to 5 iphones, but if it was 4 of each model Android phone, the iphone would be your top seller and would show up at 100% despite being only 11% of sales. Not completely true. I see what you're saying but that's assuming the poll is device specific. Its not. Its grouping android devices together. This is not individual handset sales. Well not at att, at Verizon it is individual Apple handset sales. But Android is still grouped. But that's only because there's only one Verizon iPhone. Above posters are correct. This was a s**tty and misleading survey. why? because iphone won? u have to find some reason why it cant win? Because there's no real metric by which it won. The choice of competition is weird and arbitrary, the sample is small, and the categories are poorly labelled. We don't know where the stores are or the demographics involved. And these are also not based on tracked numbers but on the word of salespeople who may or may not be right. Um... lets see... because the results don't seem so random to me, and because they match what my close friends, whom I have deemed to be credible, are telling me on a regular basis, they must be "somwhat accurate"? What do you call accurate? Apparently, removing all non-4G Android phones from the "survey" is what is required to make sure the results are accurate... apparently the iPhone 4, without "4G", is automagically superior to any non-4G Android phone... Most research/polling firms consider a data set of 1000 samples, minimum, to be "due diligence". 250 samples cuts the veracity of the result in half... someone decided to be lazy, or nit-pick which stores they would sample... There is no "underlying principle" involved here... BTIG cut all non-4G Android phones out of the picture in order to make the iPhone look better... and then also took a slight, cursory stab at embarrassing BB and WP7 in the same breath. 6% is not a bad margin-of-error... for a high school science lab result. In my chosen field of study, we deal with errors smaller than 10^-12 on a routine basis, so 6% is, like, thousands of standard deviations... not that the "survey" required a whole lot of precision, but it would have been nicer if the margin was cut in half at least. You will notice, though, that the Android phones in the AT&T sample are restricted to HSPA+, so it eliminates all standard 3G Android phones from the "survey". To assume that 3G Androids on AT&T are negligible is not a very legitimate assumption at all. tell me what 3g android phones there are that are popular? the only popular ones are the 4g ones... nd how is 6% thousands of standard deviations away when one is 34%? This same survey was done and it showed thunderbolt was the best selling Verizon phone. At that time you thought the survey was legitimate. I can pull up your posts if you'd like troll. Why no specefics and why only 4G? I'm waiting, and will still be waiting even after it comes out.